Today I want to share another layout with you from our recent trip to Disneyland, but I also want to tell you about Studio J memberships. I waited a long time to start creating in Studio J, but now that I've started, I'm hooked! Having a Studio J membership brings my cost way down. Get layouts at 50% off retail price - This is a HUGE savings! The JPG files come in both high resolution and thumbnail sizes to print, share, or archive. This is great for posting on facebook or sending to the grandparents via e-mail. There are two options for membership - 3 months for $30 and 12 months for $99. The year-long membership is the best value, of course. 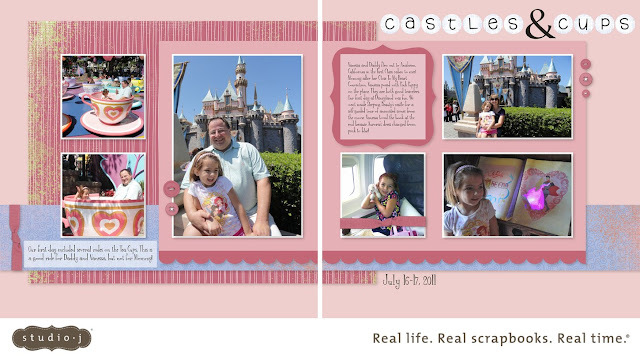 If you're ready to dive into digital scrapbooking, I believe Studio J is for you. 8. Add title using My Stickease alphabet and a text box for the "&"
10. Mat all pictures with White Daisy at 1/16"